Tarragon is one of my favorite herbs, and I always enjoy finding new ways of using it. This time, the tasty classic combination of chicken with tarragon and white wine cream sauce, came to mind, but at the same time, I wanted a lighter sauce. 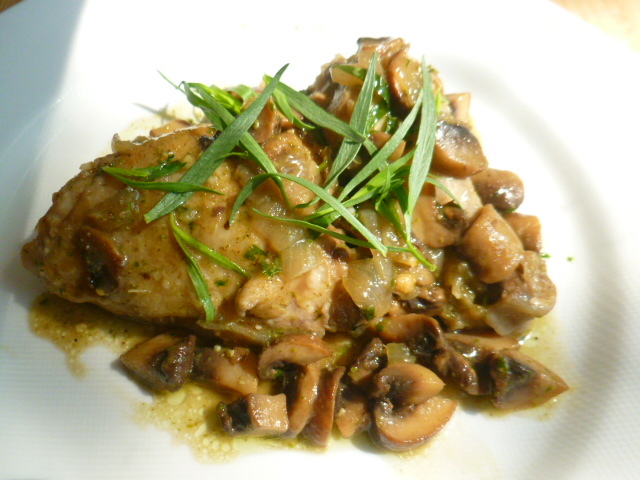 Another favorite pairing – tarragon with mushrooms – also came to mind, and as I had both, it made sense to use them all in one dish. 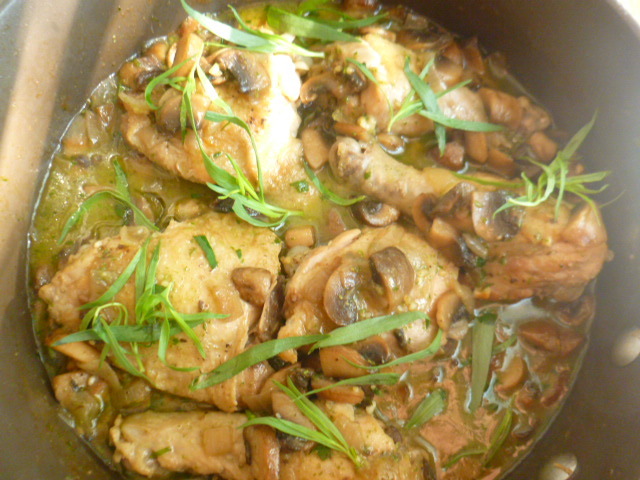 After sautéing the ingredients in a pot, I let it braise in the oven, which resulted an almost fall-of-the bones tender chicken. As I didn’t want to thicken the sauce with flour or cream, I reduced the liquids by cooking them after the braising, and by adding some of my tarragon-cashew pesto (see notes). 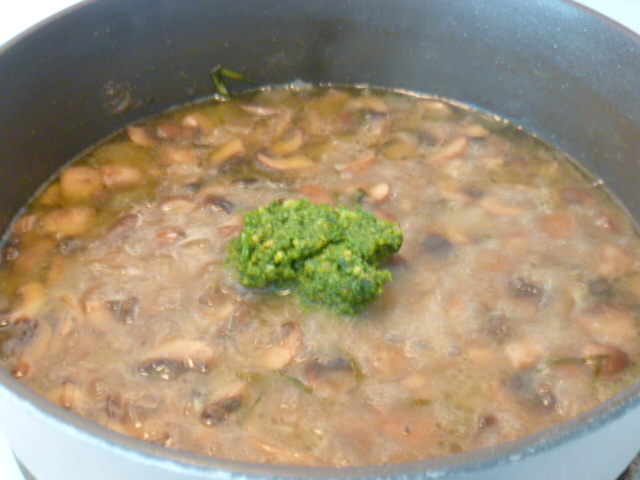 The pesto not only enhanced the tarragon aroma and helped thicken the sauce, but also added wonderful nutty and cheesy flavors to it. The dish was so flavorful, that a fresh crusty country loaf on the side was all that was needed to serve it with. Try it and enjoy. * My tarragon-cashew pesto recipe can be found HERE. If you don’t want to make it, simply add a small amount of its’ ingredients instead . 1. Heat 1 Tbs butter and 1 Tbs olive oil in a medium wide pot, over medium-high heat. 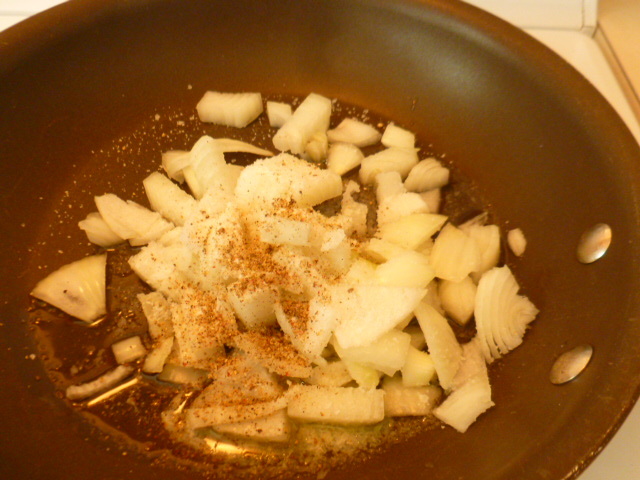 Add the chopped onion, 1 tsp salt and pepper, mix and sauté until the onion softens. 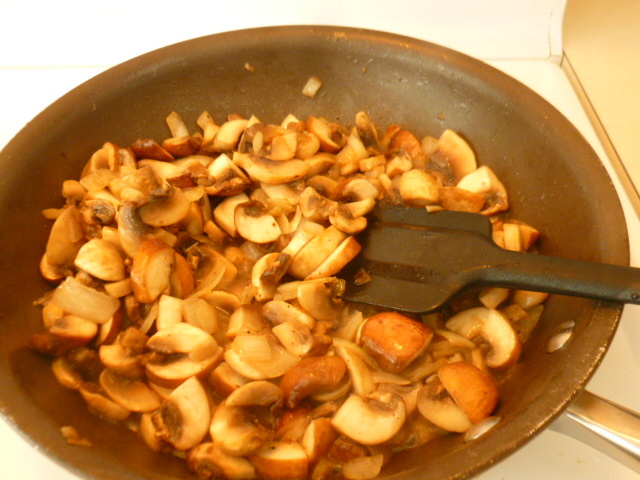 Add the mushrooms, mix well and sauté for 5-6 minutes, until they shrink and start to brown. 2. Transfer to a bowl and lightly clean the pot. Add the rest of the butter and olive oil and heat over medium-high heat. Add the chicken and fry until golden on both sides. Add the wine, honey, rest of the salt, and the sautéed onion-mushroom mix. Mix gently and add the tarragon sprigs on top. Bring to a boil and cook for 10 minutes. 3. Preheat the oven to 200F (93C). Cover the pot and braise for 45 minutes. 4. Take out of the oven, uncover the pot and discard the tarragon. 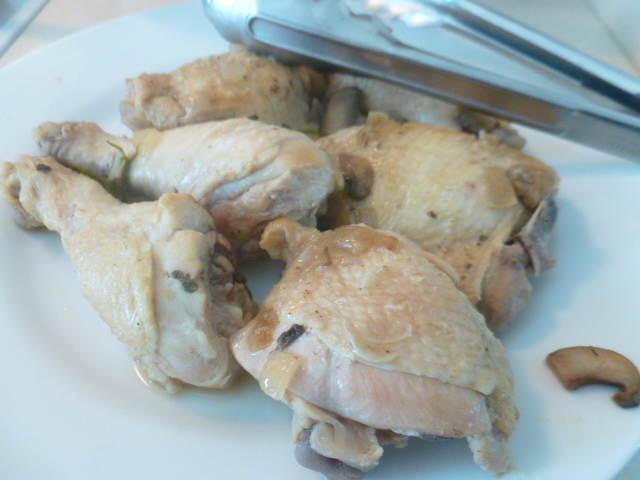 Using kitchen tongs, transfer the chicken parts to a warm plate. Cook the sauce over medium-high heat for a few minutes, until it reduces and thickens a bit. Add the pesto, mix and cook for another 1-2 minutes. Taste and adjust seasoning if needed. 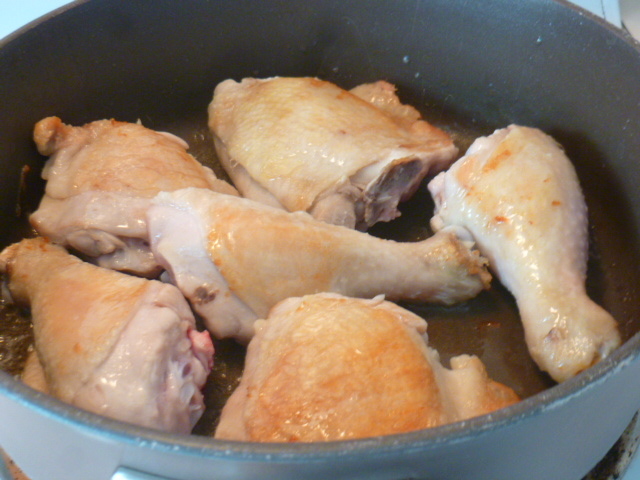 Place back the chicken in the pot, mix gently and cook for 2-3 minutes. Garnish with fresh tarragon and serve warm, with fresh crusty bread on the side. 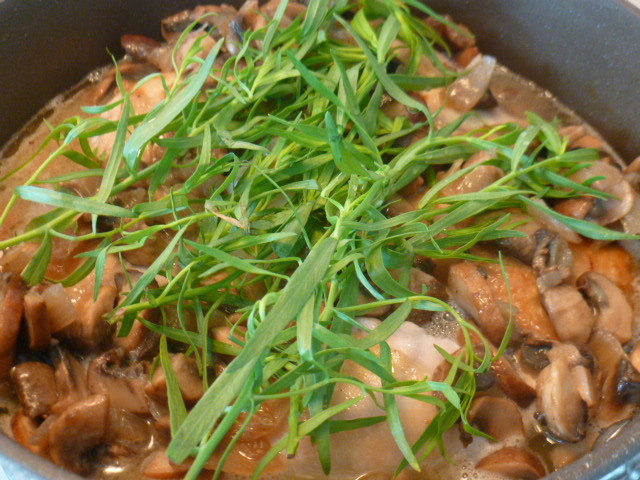 MMMMMmmmmushrooms and tarragon – a favorite! I’ve never particularly cared for cashews, but kept reading about how useful they are as an ingredient. I got an order the other day from Nuts.Com – and they included a small, one-ounce freebie packet of their roasted, salted cashews. I am hooked! They are super duper! A larger quantity will definitely be a part of the next order. Thank you Judie, I’m glad you liked the recipe, and that you’ve discovered the goodness of cashews! I used the five-grain rolled cereal that we eat for breakfast every morning (except Sunday ! ), so maybe a little extra flavor, but I couldn’t really tell the difference. The texture was perfect, though! A real winner! This recipe makes a lovely presentation, and sounds absolutely wonderful. I just realized that I’ve never used fresh tarragon. I’ve only ever used dried tarragon. I’ve going to have to look for for fresh tarragon at the store. Thank you Sheryl, I’m glad you liked the dish. It turned out so tasty, and quite easy to make and serve. 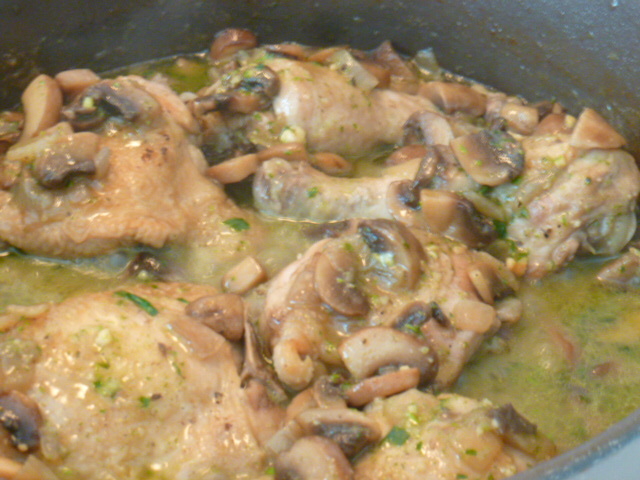 We love mushrooms in creamy wine sauce, and combining them with chicken and your cashew pesto is such a great idea – thank you, Ronit! Weather doesn’t change much here, but we love mushrooms just the same. You really do love tarragon!!! Me? Not so much, which isn’t very French of me, but I find it very sweet. Although I grow it. Fabulous recipe. In spite of ALL that tarragon! You had me at tarragon. Delish. When I read the introduction, I thought I would use Riesling if it had been me, and I was right!! It must really go well together! 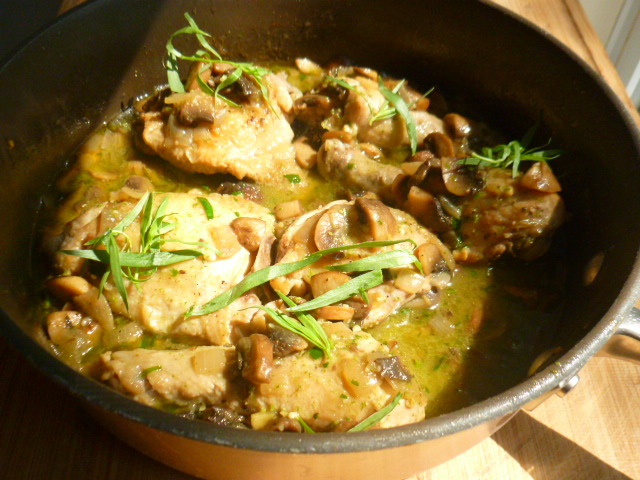 Gorgeous recipe, kind of like an upscale chicken Marsala. You are so right Laura, tarragon is indeed underrated! I think tarragon is an underused herb. I love its flavor and your chicken dish sounds wonderful. Thank you Ursula, glad this brought back tasty memories.